A valley mentioned by the prophet Joel (Joel iv. [A. V. iii.] 2, 12), where, after the return of Judah and Jerusalem from the Captivity, Yhwh would gather all the heathen and would sit in judgment on their misdeeds to Israel. 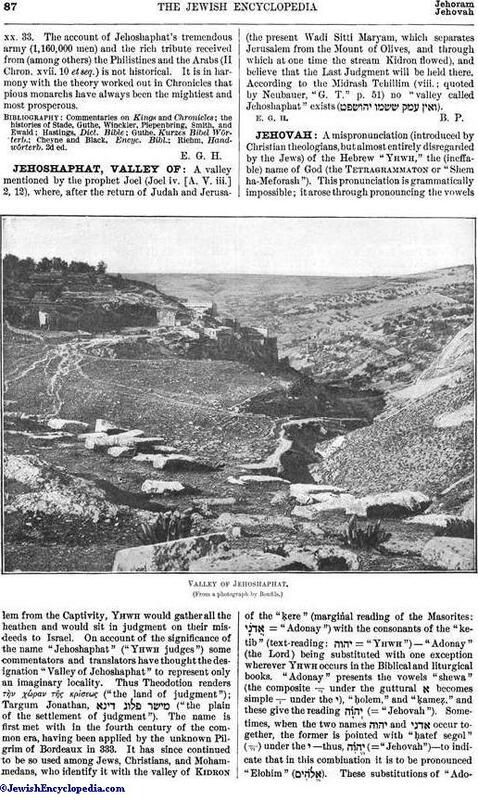 On account of the significance of the name "Jehoshaphat" ("Yhwh judges") some commentators and translators have thought the designation "Valley of Jehoshaphat" to represent only an imaginary locality. Thus Theodotion renders τὴν χώραν τὶς κρίσεως ("the land of judgment"); Targum Jonathan, ("the plain of the settlement of judgment"). The name is first met with in the fourth century of the common era, having been applied by the unknown Pilgrim of Bordeaux in 333. It has since continued to be so used among Jews, Christians, and Mohammedans, who identify it with the valley of Kidron (the present Wadi Sitti Maryam, which separates Jerusalem from the Mount of Olives, and through which at one time the stream Kidron flowed), and believe that the Last Judgment will be held there. According to the Midrash Tehillim (viii. ; quoted by Neubauer, "G. T." p. 51) no "valley called Jehoshaphat" exists ( ).